How to Choose One Key Recovery Software? With digital technology developing, users want to choose the best One Key Recovery software to back up system. Of these recovery software, AOMEI One key Recovery is the best one to help you back up your system. With computer production becoming fiercer, most computer producers improve their technique as well as change their sale methods. For example, they designed one key recovery software and function to replace the system recovery disc in Laptop. That’s to say, if your computer encounters some accident, you don’t need to insert recovery CD/DVD to get your OS back; just press a certain key to recover your system. How amazing it is! Moreover, this is easier than using recovery disc. Your computer system backup image is always stored in computer, and you don’t have to worry about your computer crash. When it happens, you can press a certain key to recover anytime. It is more easy and convenient for users to operate. Comparing with recovery disc, onekey recovery software is simpler to understand. you don’t have to insert CD/DVD. Usually, system recovery partition is created in new computer before put into market, and users will not be required to back up system. Maybe it is good for computer green hands, but to some users who masters computer knowledge, this may be annoyed. Together with system recovery software, some other programs are also preinstalled; but these tools may of no use except for taking up disk space. When you buy a new computer, recovery partition have been created in it already. If recovery partition is deleted by accident, such as reinstall system or format disk, to many users, they don’t know how to back up system again with built-in recovery function. The one key recovery application should be powerful and the system restored from it created image is bootable. Is it easy or convenient for users to operate? That is very important. For one key recovery software, it is neither a service nor a skill. So, users can’t spend too much time to learn it. If the software can’t let users reach their goal, it won’t be taken by most users. Whether the operating process can be operated repeatedly? In other words, if some steps went wrong, can the tool let us to do it again and computer would not be harmed? The software should be easy to install and uninstall, and the space it occupies must be small. The bigger the installed software are, the slower computer runs. So, as for two kinds of programs but similar in function, the software who occupies less storage space is more popular. The price of the software is reasonable and better free of charge. If you take the standards above as the judging formula, it is not hard to filter out some branded programs, and they offer adequate function to meet users demand. Comparing with built-in recovery software in computer, many third-party onekey software are not designed for specific branded computer. Yet, they have been beyond some branded software and break the limitation of brand product. Of these third-party software, AOMEI One key Recovery is a good example. AOMEI One key Recovery likes Lenovo one key recovery, which is a kind of insurance policy for your computer, but it supports backing up all types of laptops and computers, not only Lenovo laptops. Moreover, this program can help you create a factory recovery partition, make system backup and restore in case of system crashes, and you can use it to restore your computer to its factory default or a previously backed up state by pressing "A" during the process of system startup. 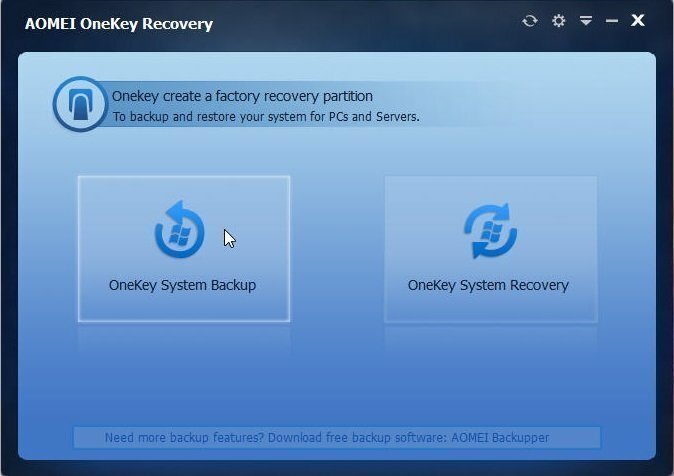 As mentioned above, if you just buy a new computer or reinstall your system, you can download AOMEI OneKey Recovery in AOMEI official website to try. First create an initial backup. Then, when system fails in the future, just restore OS to factory settings from the initial backup.